NEW BRITAIN - Sometimes friends fight. For Josephine Fox and Alya-Lynn Mercado, both members of New Britain Judo and Dynamic Arts, their fight was all in good, competitive fun. 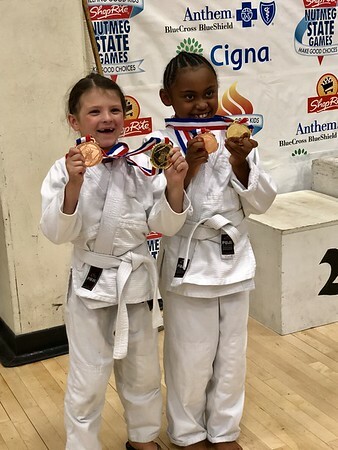 On Saturday, the two made their way onto the mat, bowed and then competed against each other in the the Nutmeg Games judo tournament. And as the friends sparred, it was Mercado who came out with the win in the opening round of the girls three-team, double-elimination 6-7 age group at New Britain High School. By the day’s end, there was plenty for the friends to cheer about. Mercado went on to win the bracket and take third in the girls 6-8 division. Fox, meanwhile, had plenty of success of her own. After taking third in 6-7, she claimed the girls two-player, 6-7 pool. Besides participating in judo both girls play other sports. When no practicing her kicks, Fox is involved in gymnastics and ballet. Saturday was Fox’s first official fight. And although she has only practiced fighting a couple times, she enjoyed the new experience John said. Mercado is also involved in gymnastics, but as of right now, she is putting a majority of her focus on judo. Although Mercado has only been involved in judo for just a year, her mother sees great potential in the years to come. Saturday was certainly a good indication. After Fox and Mercado finished up their matches and awarded their medals, the two posed for a picture. Sometimes, it’s OK for friends to fight. Posted in New Britain Herald, New Britain on Saturday, 21 July 2018 19:32. Updated: Saturday, 21 July 2018 19:34.